When you are ready to start up your process mapping project spend some time agreeing on the standards that everyone will use to create and publish the maps. This will save anguish later, as you try and bring order to a growing collection of process maps. Use a logical name for the process folder containing the files in your project. e.g. Account Management process. Ensure you have a common role list for the relevant process e.g. Account Management may have sales, support and financial roles included in a shared template. 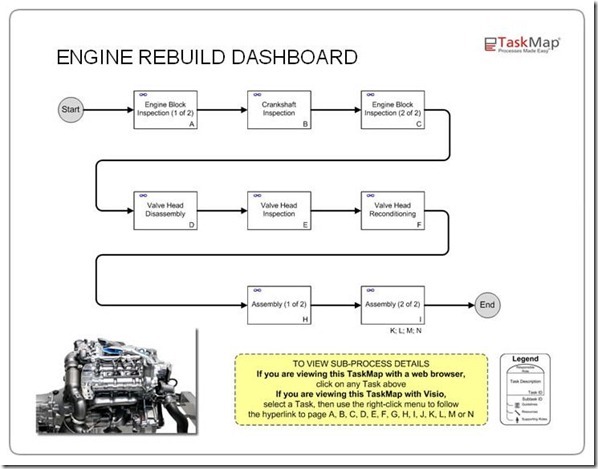 Example of dashboard for navigation to lower level processes.